It’s not everyday I get excited about the newest bibles on the shelves of Christian stores everywhere. There have been some game changers in the past, i.e. the ESV Study Bible or the Reformation Study Bible, and though those are great helps to the body the Scriptures have not had an apologetic aid to them until just recently. That’s one reason I’m excited about The Apologetics Study Bible for Students. Not only does this bible contain the inerrant and infallible word of God but it contains alongside it, well-researched articles on various aspects of our apologetic endeavor. With Sean McDowell as the general editor it’s hard to go wrong here. The inserted quotes fit perfectly within the context of each book of the bible by anticipating the questions students will have when they come across certain material. For example, in Philippians 2 we see the crowning explanation of both the humanity and divinity of Jesus Christ. Here is placed an article by Dave Sterrett on How can Jesus be God and Man? Has there been a bigger challenge to Christianity in recent days than that of the humanness and Godness of Jesus? This certainly becomes a hot topic when guys like Bart Ehrman are introduced to the unassuming reader. Is there a downside to this version? All additions, by way of aids, to the Scriptures are bound to be fallible. Even the 1689 London Confession, as good as it is, was penned by men. Here we have some of the best names in field of Apologetics, guys like Mike Lacona, Brent Kunkle, John Stonestreet, Scott Klusendorf, and Frank Turek. I feel they have left some out who have been contributing to that field. Here I have in mind K. Scott Oliphant, John Frame and other thinkers in the Van Tillian camp. Covenantal Apologetics have been left out and in its place Archaeology has taken center court. There also seems to be a lack in the back-end of this bible. When compared to my other study bibles there are significantly fewer pages given over to things like a glossary or subject indexes. As a student bible I both understand and am confused by this lack of content. I get that the publishers don’t want to overwhelm the student with unnecessary additions but I also would like my students to have all the info necessary at their fingertips in one volume. Perhaps a future volume will be a bit more filled out. Overall this Bible is pretty impressive. It not only gives answers to the questions culture is asking but it gives a new generation of Christians a wonderful reference in dealing with the questions they themselves are asking. If not for those outside the church, though it should spill over, this Bible is a breath of fresh air. I am glad the sometimes-lofty field of Apologetics is being incorporated into the reading of God’s word. It’s been far too long since we’ve had a significant voice in the culture. As the days grow seemingly dimmer, the directives for Christians are clear; Honor Christ in your hearts as Lord and be prepared to give an answer for the hope you have. This bible helps us do that. McDowell, S. (Ed.). (2009). 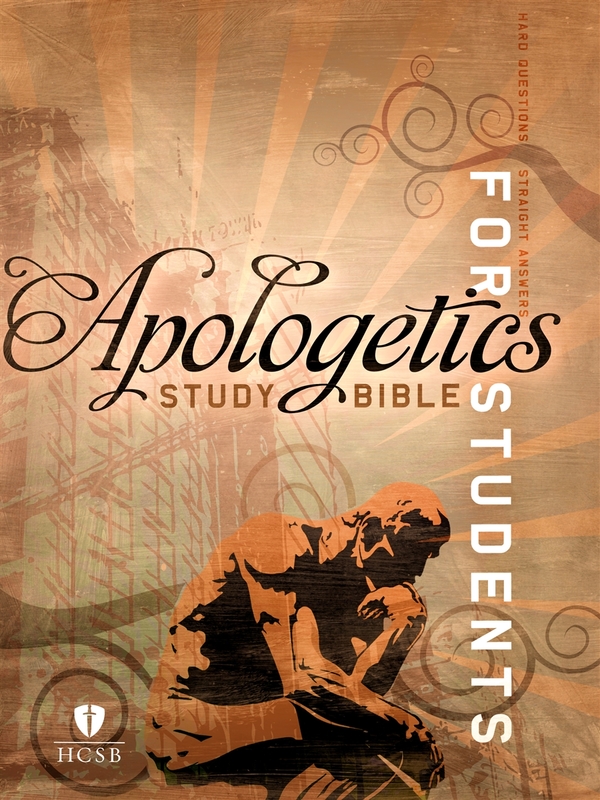 The Apologetics Study Bible (Student Edition ed., p. 1440). Nashville, Tennessee: Holman Bible.